A couple of years ago an e-mail tumbled in from an online review site.The feature story was a floor standing speaker 36 inches tall, rather skinny with a 5 inch woofer and 1 inch dome tweeter. The usual ham nʼ eggs sort of review, silky highs, authoritative lows, crisp midrange etc. The dimensions were given as well as a $2200 a pair price tag. Something was conspicuous in its absence. No weight was given. Youʼd think that the reviewer would trot out his trusty bathroom scales to complete the report but no, not available. The website of the speaker manufacturer was then checked out. An eyebrow raising moment to be sure. The model of speaker as reviewed was described in all too familiar terms. The description was exactly the same as the review save for one altered word. And no, the manufacturer didnʼt give the weight either. Then I twigged as to what the game was. The review was done by a chap who had simply gleaned the info from the makerʼs site. I am convinced that he never clapped eyes on the actual speakers, never mind fondled the product. No wonder he couldnʼt weigh them. The review site was festooned with ads of course. A few hundred bucks from each “review” would keep the writers in scotch for long enough until the next episode. The avalanche of online audio promotion is simply a veiled version of infomercials like the ones seen at 3 a.m. for the Veggie-Whiz-Slice-o-Matic. Nothing seems to matter in these fraudulent reviews except the “cool” factor. Sleek lifestyle designs and fancy faceplates abound. None of the reviewers seems to own a voltmeter or a tape measure or bathroom scales. You can play Audio Bingo along with the reviewers. 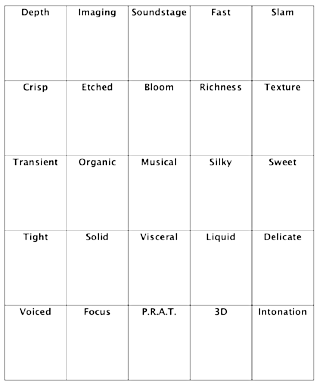 Below is a Bingo card displaying 25 subjective words which you are bound to read in the magazines and on line sites.The centre square is a freebie since the term “musical” is the default position in just about every piece of gear reviewed. From $29.95 to $850,000 someone will always try to slip in the old “musical” dodge. Have fun. Every line completed allows you another beer.